Go the home screen and click the Manage Connections icon. The icon looks like a small radio antenna. Click in the Bluetooth check box. That turns on that form of radio communication. Make sure your BlackBerry is set to be Discoverable by other devices. 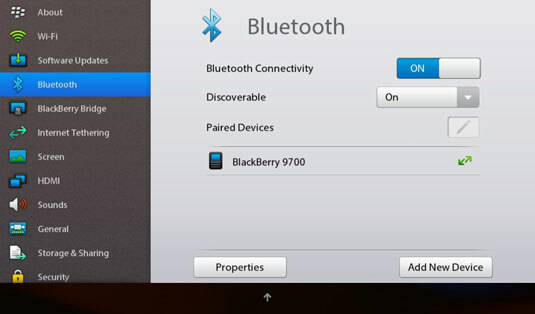 Turn on Bluetooth connectivity on the BlackBerry PlayBook. 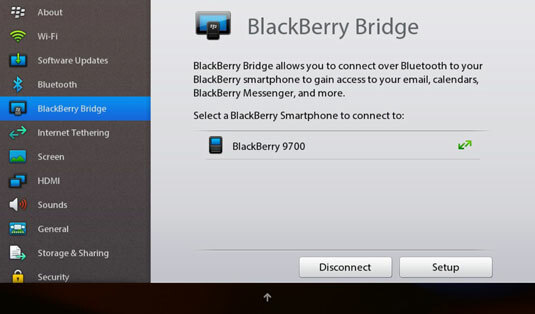 Now go to the BlackBerry PlayBook and click the gear icon. Follow the instructions to pair your tablet to your phone. Once the process has been successfully accomplished, future attempts at connection should be quick and seamless. 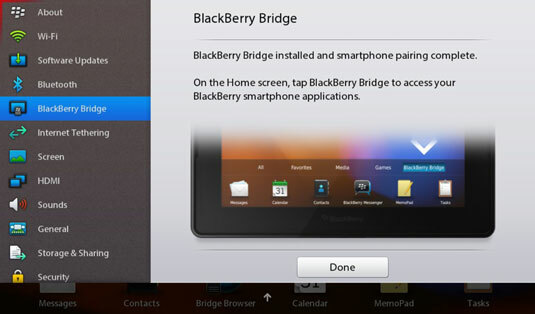 One fast shortcut to a BlackBerry connection is to tap one of the BlackBerry Bridge app icons on the tablet’s home page: Bridge Browser, Calendar, MemoPad, Tasks, or Bridge Files. If a link doesn’t exist, the PlayBook will tell you what needs to be done. The connection can be done with a manual pairing or, once again, you can ask the tablet to display a barcode for you to scan with your phone. Acknowledge a message displayed on your tablet or phone that asks you to permit the other device to open the Bridge. The automated process displays a numerical code on each device. You need to verify that the same code appears on each. 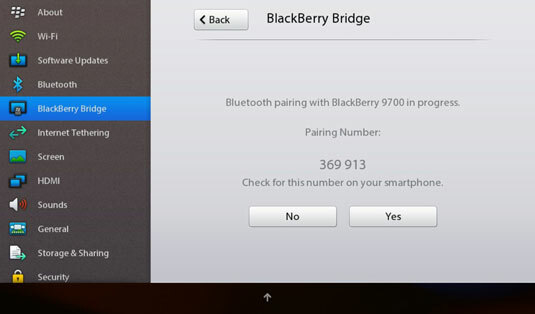 If you chose a manual process (which walks you through the steps on each device), the final approval comes when the BlackBerry PlayBook displays a setup code that you must enter into a corresponding permission panel on your smartphone. Either way — automatic or manual — these protections guard against an attempt by an outsider to hack into your BlackBerry fortress. After two devices have been granted permission to interact with each other, you don’t have to go through the verification process; instead, they recognize each other anytime they’re both powered on and within communication range. When all is ready to go, you see a report of successful pairing. If the devices have been previously paired, a notification appears on each device when they’re electronically reacquainted.